If you have been following along with me on twitter & Facebook, you will know that it has been a busy few weeks! First, in mid October I had the most amazing opportunity to travel to Vancouver to attend the Food Bloggers of Canada Conference where I met lots of fellow food bloggers, ate delicious meals and networked with several brands (more on the conference in later posts!). I have also been baking a lot of macarons lately and recently have been teaching macaron classes! So, today's post comes from one of the macaron classes that I did this past weekend. Seeing that we are still in the season, the two ladies decided on making pumpkin spice macarons! The recipe for the pumpkin spice macarons are actually covered in my Macaron 102 and Macaron 103 posts, so head on over to those two posts for the step by step directions. Also, if you haven't seen my post for making your own pumpkin spice make sure you take a look at that one as well! 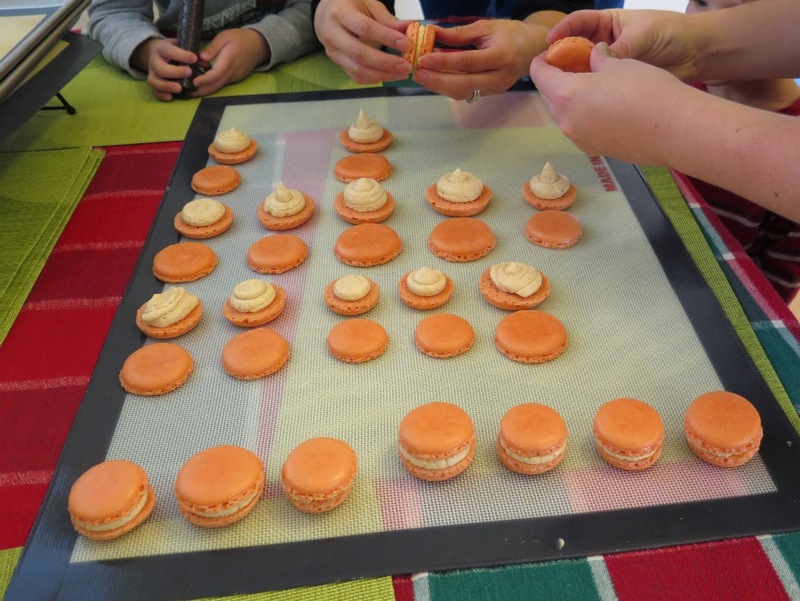 I often get asked about what is involved with learning how to make macarons. You can make macarons in the comfort of your own kitchen! Over the past 3 years I have tried and tested many macaron recipes in a apartment kitchen with no special ovens. Lately, with the houses I have visited to make macarons I have brought along a simple oven thermometer ($5) to keep the baking temperature consistent. So, it goes without saying that you CAN make macarons in your home kitchen. I have found that heavy baking pans (also known as heavy commercial jelly roll pans) are essential for making macarons. I also use a stand mixer such as a Kitchen Aid in order to beat the egg whites quickly and consistently. However, if you are comfortable doing this by hand such as using a whisk or a hand mixer it is possible. A silicon baking mat (e.g. silpat) is nice to have, but not essential for baking macarons. You can use parchment paper. For other equipment and ingredients that you will need, please read my Macaron 101 post. Do I need any special skills before trying to bake macarons? No, you do not need any special baking or pastry skills before trying to make these delicious treats! The mixing process (also known as the macaronage) requires special attention to ensure that you do not over or under mix. Lastly, piping same sized macaron shells can be tricky at first but practice makes perfect! Each batch of my macarons produces around 60 shells so you will get lots of practice! I tell my friends who want to learn, that it takes at least 4-6 hours for their first batch of macarons. This is mainly due to the time it takes to prep the ingredients, mix, pipe, resting time, bake and fill the macarons. As well, what surprises many people is that the best time to eat and enjoy a completed macaron are after they have rested in the fridge (in an airtight container) for 2 whole days! How long do homemade macarons last? I typically freeze a portion of my completed macarons in the freezer and they are good for a month in an airtight container. The macarons in the fridge will usually stay fresh for about 5 days or 1 week after filling. When you are ready to eat the macarons, take them out of the freezer and keep them in an airtight container to defrost for at least 2-3 hours. Ensure you keep the lid on the macaron container while they defrost on the counter at room temperature. My intention for this post is to show that macarons can be made at home. I was extremely happy that I had the opportunity to share my excitement for making macarons with some new friends! Please post any questions that you might have in the comments below! Great post, Lillian. Macarons are one of those things I'd always been a bit scared to try and make because of how difficult everyone says they are! This is an awesome post about the ins and outs of making macarons. I have always wanted to make some but was too intimidated to try. Where do your lessons take place? When I was teaching my friends they often occurred at their house or mine. For this macaron lesson, it was at their house. Thanks Jessica! I really encourage you to start even if everyone says it is difficult because the results are so worth it! I also didn't want to keep paying $1.50 for a macaron everytime I wanted once so I was convinced I needed to make them!